First our passports going abroad now Big Ben... DISGRACEFUL! Big Ben which is the name of the bell and not actually the Elizabeth tower fell silent on August 21 last year as part of a major refurbishment and conservation work at the Palace of Westminster. The 13.5 ton Great Bell had been ringing every 15 minutes since May 31 1859 although at the start in the bell’s life a crack developed in the cast iron. The bell was revolved and a lighter hammer was added and Big Ben continued to ring out almost without pause until late last year. Now it has been revealed the iconic bell is now set to be shipped over to be fixed in Paris, France! In line with the same tendering process that saw production of the forthcoming British blue passport handed to Franco-Dutch firm Gemalto the Big Ben contract has gone to the Paris-based Bossu Bell specialists. Big Ben was cast at the Whitechapel Foundry, which also cast bells for St Pauls Cathedral and the famous Liberty Bell in Philadelphia. 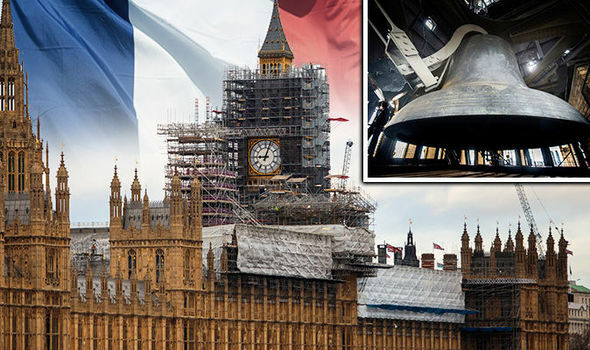 Some people working on the bell in France have intimated that when the bell returns it will chime more like traditional French Bells and will signify that after Brexit we are still part of Europe. Read: "Any idea which city now has a higher murder rate than NEW YORK?!"